This month, our Kaleidoscope team had the privilege of attending the Sustainable Packaging Coalition in Chicago, Illinois. A conference of individuals, companies, and brands that are passionate about making a difference in their efforts as it pertains to sustainability in packaging. This year, the conference featured speakers from packing supply chain operations, research and development, leaders of big brands in the industry and individuals who represent programs in cities that help make sustainable packaging a commercial reality. The attendees of this conference do not shy away from their beliefs and are passionate about the subject, and this year was no exception. It was a place to share ideas, be aspirational and set goals for everyone – designers, creatives, researchers, manufacturers, engineers and consumers. One the biggest trends we see in sustainable packaging for 2018 is bio-based/compostable material. From entrepreneurial to Fortune 500 brands, there are many efforts in offering consumers a simplier way to be environmentally friendly. 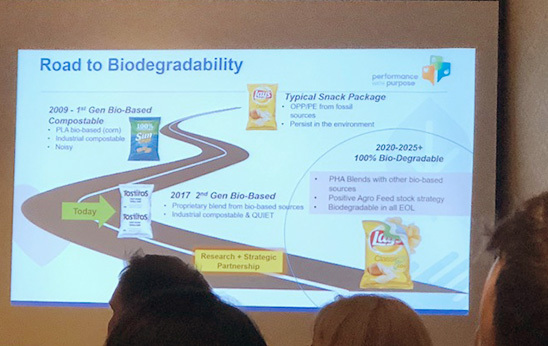 PepsiCo partnered with Danimer Scientific in 2017 to develop a PHA, a food safe biodegradable film. This film has properties that are not noticeably different to the original package and has the same sound, texture and protection, and by 10-24 weeks after use, it is completely biodegraded. Their plans are to continue their efforts with the PHA film and by 2025 have it rolled out into their brands and into consumers’ hands. “Our limits are not the technology, but the consumer behavior.” One of the biggest barriers in sustainability in the US is the lack of education that consumers have and the efforts to regulate it. It is evident that there are several states that are making tremendous movements and changes within their communities to establish programs such as Seattle, Washington and Colorado, but the problem still relies on the fact that success is also dependent on the behavior of the consumer. No matter the efforts that go into progressing technology, utilizing recycled material, simplifying packaging for easier recyclability, and investing in recycling facilities, if consumers are still throwing away their packages in the garbage (and thus in a landfill), we are still losing half the battle. The question comes down to how can we make recycling matter in the hearts of consumers?